Davidi Kitai has become the first ever Belgian player to win an EPT after he defeated Andrew Chen in an epic heads up battle. We’ve used the word epic before this season to describe the many long heads up battles we’ve seen, but today we use it to describe the sheer quality of the poker on show. Many here have commented how they believe that the heads up battle here was the best of the season. There were five-bet pre flop jams, check-raise river bluffs, three-bet three-street bluffs, and brave all-in river calls with marginal hands. Chen was Tweeting back on day two (when he was very short stacked) that he had a feeling that he might bubble the event. Just a few days later and he has a cheque for €613,000 in his back pocket. Chen felt he didn’t play that well heads up but was not too disappointed as they had done a deal. Buddiga won the Skrill last longer as well so got his €5,000 buy-in back. If today only whetted your appetite for more top level poker action then you don’t have to wait long at all. We move straight on to Monaco for the PokerStars and Monte-Carlo®Casino EPT Grand Final. Right off the bat at the festival on Monday the biggest ever buy-in tournament in Europe will be taking place. The PokerNews reporting team will be there to cover all the action from the €100,000 buy-in Super High-Roller event. Don’t worry about the €10,000 buy-in Main Event that starts just two days after that as we’ll have that one covered too. 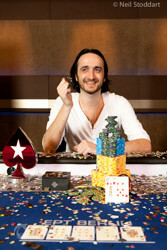 From the button, Davidi Kitai raised all in holding the . 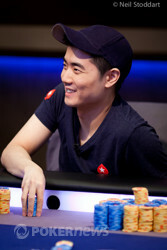 Andrew Chen looked down to see the and made the call to put his last 2.455 million chips at risk. The flop came down and Kitai took the lead by hitting the king. The turn was the and that left Chen needing an ace on the river to stay alive. The hit the end of the board and that was all she wrote for Chen. Kitai won the pot and eliminated Chen in second place. For his finish, Chen walked away with €613,000. From the button, Andrew Chen raised all in fro 2.205 million with the . 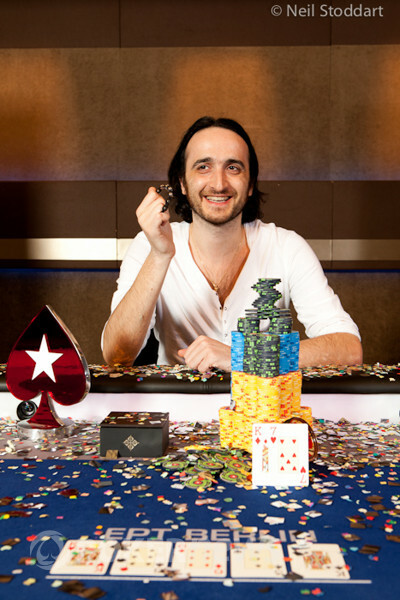 Davidi Kitai folded and Chen won the pot. The players are on a 15-minute break. Here's how they stand. 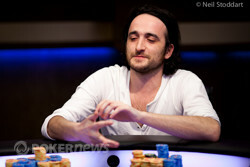 From the button, Davidi Kitai raised to 360,000 with the . Andrew Chen reraised to 950,000 with the . Kitai moved all in and Chen folded. Davidi Kitai has retaken the chip lead in dramatic style after another great call on the river. He had opened to 350,000 with then called when Andrew Chen three-bet to 900,000 with . Neither player hit the , Chen bet 615,000 and Kitai made the call. The on the turn was a blank but that did not stop Chen betting again, this time increasing its size to 1,480,000. Kitai made the call and it was off to the river with a huge pot brewing in the middle of the felt. The was the river card and Chen moved all in for 11,190,000 and he covered Kitai. Kitai went into the tank for three minutes, going through the hand in great detail in his head. Eventually he sat up and said, "yeah, I call" and as he saw his pair of fives was good a huge smile spread across his face. Chen laughed but must have felt sick as Kitai had hit a three-outer on him. The conversation between the players suggested that Kitai thought his king-high was good! Amazing stuff here in the EPT Berlin Main Event!